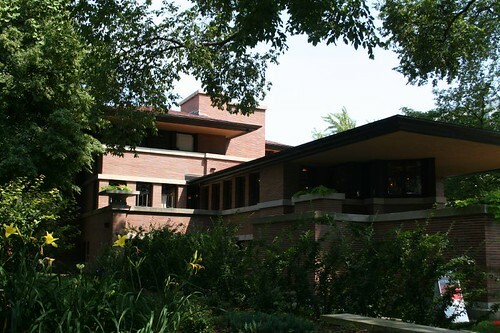 Frank Lloyd Wright’s landmark Robie House is slated to close for extensive interior renovations starting in November, as announced publicly in a neighborhood newspaper today. The house is currently open daily for volunteer-led tours. Renovation at the house has been ongoing for several years; visitors to the house witness the construction in progress, and at times various rooms have been closed off and unavailable. The Frank Lloyd Wright Preservation Trust, which operates the house, recently secured a $5 million dollar loan, allowing renovations to speed up. However, the expanded construction schedule means that the house will be completely closed off for the first time since tours began nearly ten years ago. Much remains unknown about the operational changes that are planned when the house re-opens; the article from the Hyde Park Herald speaks of not re-hiring the current guest services staff, and mentions the possibility of “all-day events” and renting the house out. How this will affect public access to the house (which, after preservation and restoration, is the Trust’s primary mission), and how it will affect the Trust’s goal of operating the house as a museum, remains to be seen. It appears the house may be closed for well over a year, based on a 2010 re-opening date mentioned in the article. This entry was posted in Hyde Park, Life in Chicago, Prairie Style, Preservation & Renovation. Bookmark the permalink. From what I understand, there’s a pretty nasty fight brewing over the reopening plans. I hear that the Trust didn’t really intend to reopen the house to the public at all. The volunteers (myself among them) haven’t been told much about what’s planned for the post-renovation house. This has indeed led to a lot of speculation, nervousness and accusations. I’m of a wait-and-see mind myself, but the things mentioned in the article are certainly cause for raised eyebrows. Thank you for your article. Its beautiful and interesting. Continue your great work. Congratulations! !